ST. GEORGE — An ancient skeleton found near Moab has been identified as a new dinosaur in the sauropod, or “long-neck,” family. 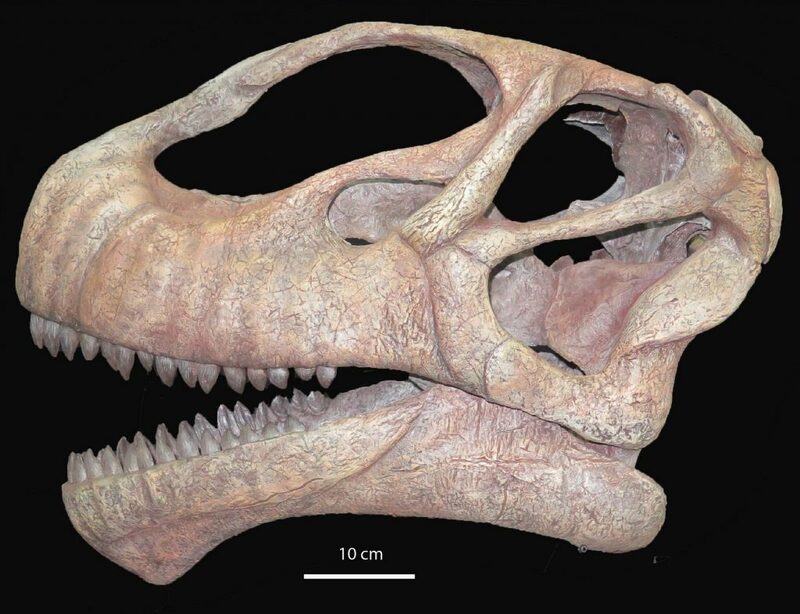 Researchers say the dinosaur is related to another long-neck that inhabited the ancient European continent before immigrating to the Americas. The findings, published Monday in Scientific Reports, describe Mierasaurus bobyoungi as a 32- to 39-foot-long herbivore that met its end some 130 million years ago during the Cretaceous period and became fossilized in the Doelling’s Bowl Bone Bed in Grand County, a site in the Cedar Mountain Formation rich with rare fossils. 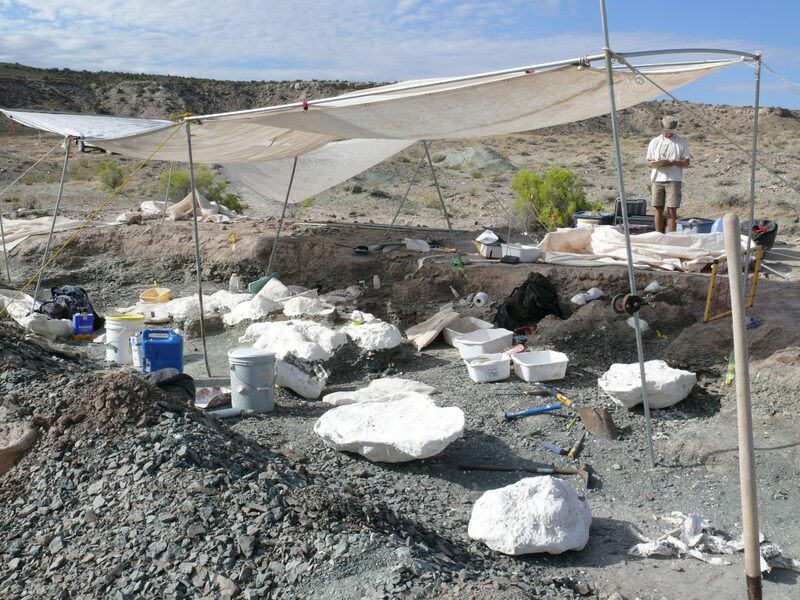 Following a flash flood in 2010, some large bones were observed by Enterprise resident Gary Hunt, a former Utah Geological Survey geologist, at the base of a dry wash adjoining the bone bed. Excavation efforts revealed the skeleton of a mired long-necked dinosaur with both a forelimb and hindlimb extended down into an ancient marsh deposit below the level of the rest of the skeleton. The excavation team, led by Dr. James Kirkland of the Utah Geological Survey, ultimately discovered and prepared two separate specimens, one of them found in very well-preserved condition, complete with skull, teeth, neck, back and tail, bones of the shoulder and hips and bones of the front and back limbs. It is the most complete individual sauropod ever found from the Cretaceous period. 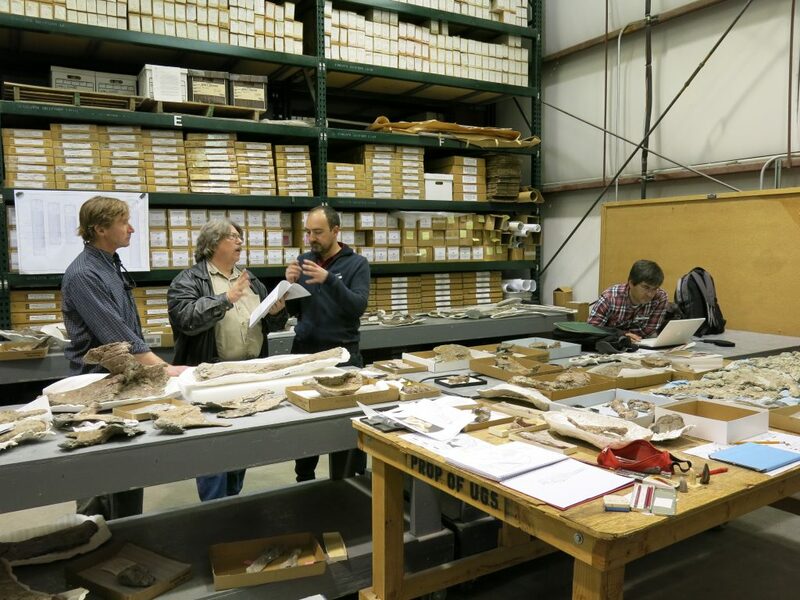 Utah geologists collaborated with researchers from Spain and the United Kingdom in 2016 and 2017 to identify the dinosaur as coming from a line of massive sauropods that emigrated from the European continent between approximately 140 and 150 million years ago. 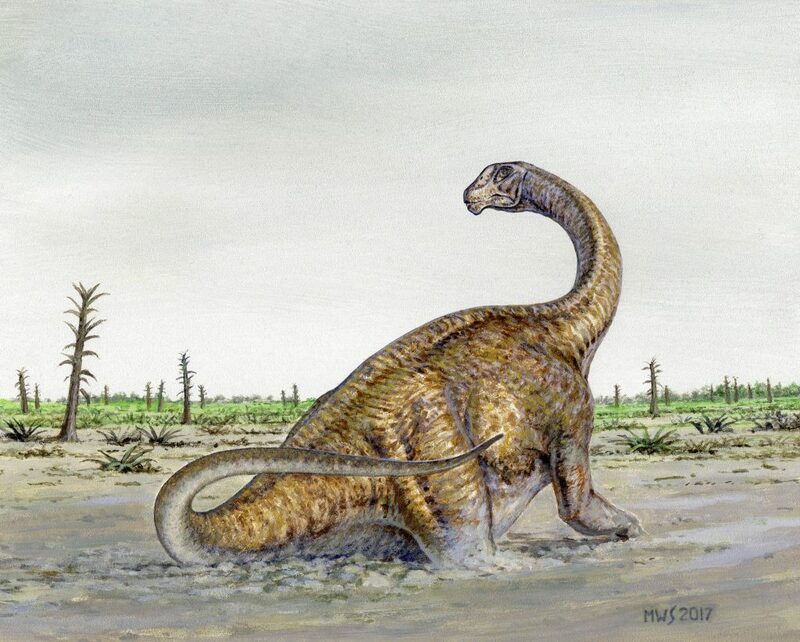 “It was not until we worked with Spanish paleontologist Rafael Royo-Torres, that anyone recognized it as belonging to a distinct group of European sauropods,” Kirkland said, adding that the Utah scientists almost certainly would have otherwise compared the new dinosaur with another well-known North American family of sauropods. 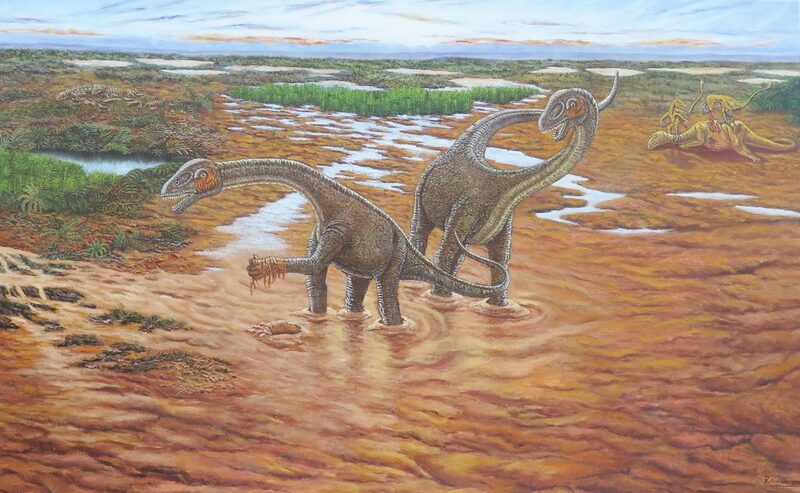 The researchers believe that this new group of European invaders replaced the sauropods whose fossils are found in underlying and older bone beds in Utah and hypothesize that they may have arrived before the Atlantic Ocean fully separated Europe from North America. The ancestors of the Mierasaurus came from the Turiasauria family, primitive sauropods from the Jurassic era found in Europe. 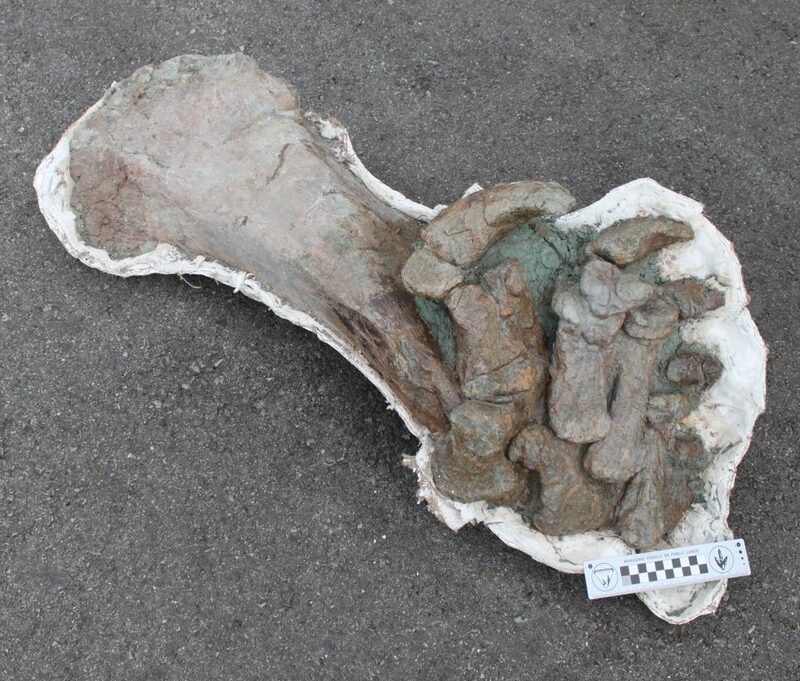 Researchers also recognized that another recently discovered Utah dinosaur, Moabosaurus, belongs to the group as well. The Mierasaurus and Moabosaurus have more primitive characteristics when compared to other sauropods from North America. In addition, the Mierasaurus, estimated at between 32 and 39 feet long, was much shorter than its European Turiasaurus relatives, which could surpass 82 feet in length. Paleontologists named the genus, Mierasaurus, for the Spanish cartographer and scientist D. Bernardo de Miera y Pacheco, who lived from 1713-1785. Miera was the scientific leader of the 1776 Domínguez-Escalante Expedition, which, similar to the new dinosaur, was the first known arrival of a European scientist into what is now the state of Utah. The name of the species, bobyoungi, is dedicated to the American geologist Robert Young, who conducted the first comprehensive work on the Early Cretaceous age geology of the Colorado Plateau where the Mierasaurus was discovered.